I love fairy-tales. 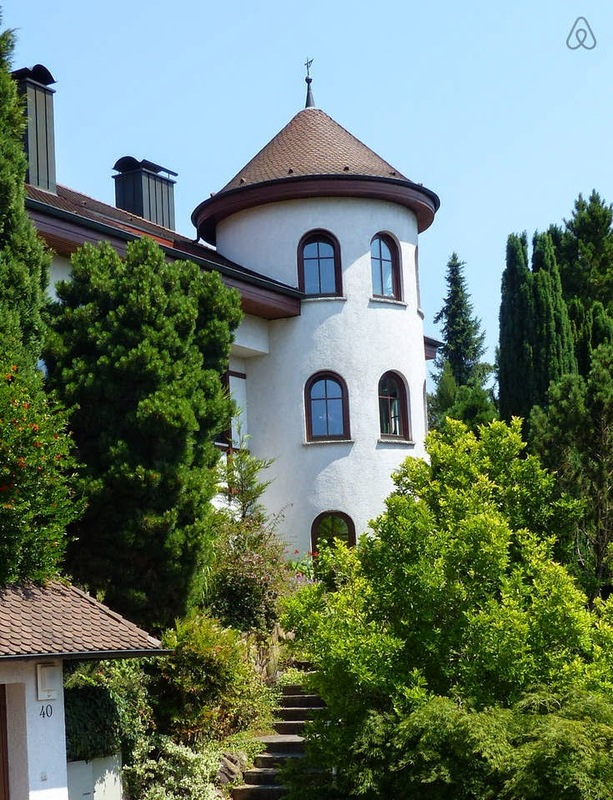 I have often imagined living in a Castle like a fairy-tale heroine! The explorer in me wants to travel, loves to travel and has many places on her wish-list to explore. Black Forest in Germany is one such place. 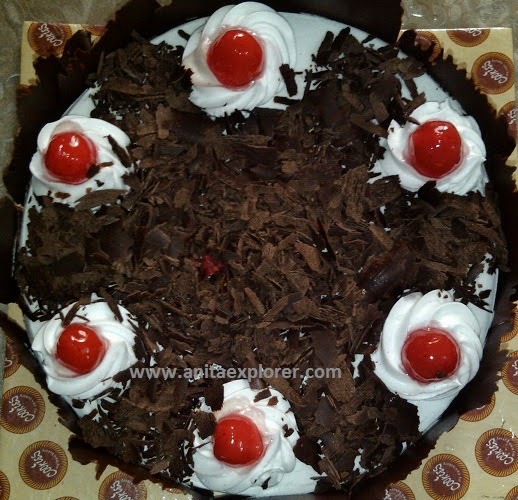 We all might be familiar with the Black Forest Cake and might have tasted it. Did you know that the name of the cake has been derived from the German dessert that literally means "Black Forest cherry-torte” that originated in Germany? As I love Black Forest cake so much, I have plans to visit its place of origin & try it out! Yummy! The foodie in me wants to eat such delectable treats! 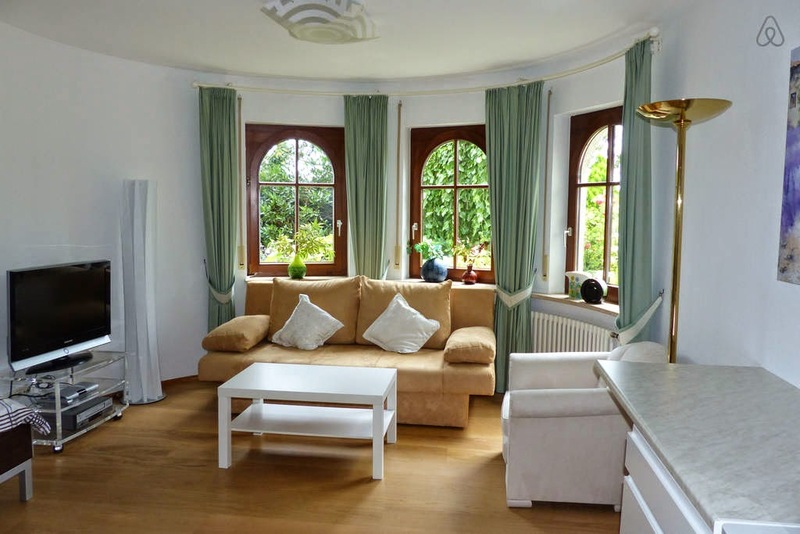 Dreaming of visiting Germany, I looked for my choice online using Airbnb. I was delighted to find ‘a little room in a castle tower’! This matched my search criteria requirements perfectly! Ever since I read about Rapunzel, who stayed in a tower room, I have dreamt to do the same! Would be so much fun to stay in a Castle, that too near the Black Forest, Germany that I dream to visit! This tower room in the castle looks cool & comfortable! The accommodation has amenities like free Wireless Internet, SAT-TV, Heating, Coffee machine etc. I was delighted to access info about this home away from home thanks to Airbnb. Airbnb offers us a chance to Rent unique places to stay from local hosts in 190+ countries. Distinct locales around the world viz. the unique castle that I chose, available for accommodation, are thus accessible at the touch of a mouse-button. It’s convenient to choose where we wish to stay as per our plan! In my case, I just looked for “Black Forest Germany” and I got a host of options from which I could pick and choose and confirm my host! 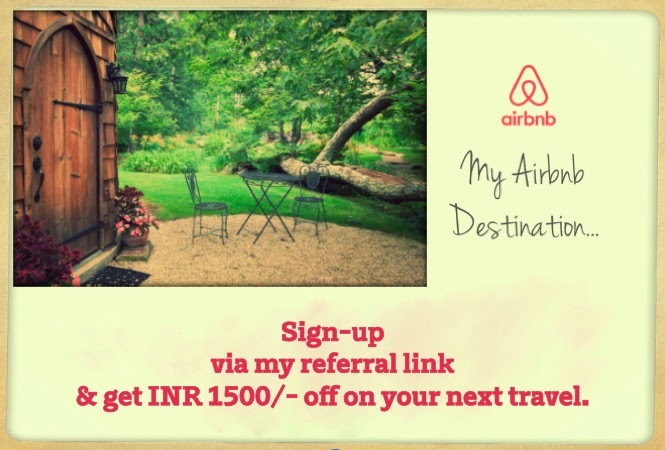 Airbnb offers all the readers of my Blog, who sign up with Airbnb, a travel credit of Rs 1,500 to use toward a new reservation i.e. for your first booking. Join Airbnb by creating a new Airbnb account using this link please! With Airbnb, explore across the seas, save the memories & say Cheese! Do you dream to stay in a Castle? What type of accommodation interests you? Quite a post,Anita! So tempting your cake is! Black forest is super romantic place...And much like much of Germany not travelled by us Indians...maximum people travel to Germany for Oktoberfest..Castles in Black forest are super places...Would love to visit it...Great article ...DO write more abt such places!! Yes, Oktoberfest is very famous. Castles & cakes are great too. Thanks for stopping by, Deepika. Black forest cake is so yummy. Black Forest, Germany is a wonderful place to visit. We had loads of fun, when we visited two years back. Hope you get to visit soon. Thanks for sharing & for your wishes! Black forest cake looks yummy :). Thanks for telling the story behind fav cake and castle took me to fantasy world. My pleasure. Always wonderful to visit fantasy world! Miss eating Black forest Cake ! I didnt know the connection between the cake and the place. Oh, that castle looks amazing! Amazing pick, Anita! How I wish to stay in there someday. Thanks Arti! Glad you liked my choice! Your apartment looks wonderful! Are you going to grow your like Rapunzel? The cake must have been heavenly! Thanks for your wonderful words, Wil! No, my hair isn't a fraction of Rapunzel's hair :) Yes, the cake was heavenly. I love black forest cake but i like your choice of the apartment even better! Have a great holiday in Germany! Yum cake and the tower room ... awesome Anita .. And dear the castle looks Beeeaaauutiiful ...........(swooning ) All the best fro the journey :) loved the bit of info about the Black forest cake ! Journey is in dream stage :) Thanks for your advance wishes! I have been to both Germany and Austria a few years ago an both countries were great to visit. Black Forest cake is really yummy and has bee a favourite of mine for years. I do hope you manage to visit your dream holiday destination and let down you hair like Rapunzel did. So I guess when you WANT something so much, it can become reality. Looks like a precious place to stay. Cherries and chocolate can't be beat! That's what Coelho's Alchemist book says- The whole Universe conspires if we really WANT something so much! My Grandma used to bake it ! Delicious ! I also want to be a princess in a castle ! That's lovely to know, Gattina! Thanks for sharing. Do you have to write such posts when I have no leaves in sight? I love this little tower room, what a fun place to stay! Germany is a beautiful country, I lived there for 2-1/2 years when I was in my 20's. It was an experience I will never forget. My son was born there too! :-) Black Forrest Cake is delicious! We love cake & also places like these that are fun! Thanks for sharing your special memories, Josie! Thanks for linking with Abracabadra, Anita! Hope this virtual travel becomes real soon! Delighted that you liked reading this. Hope you get to your BF cake there soon. Yes, the feedback is that the place is very romantic! Thanks for your hearty wish, Indrani! This place looks cool too :) I have stayed in castle in Scotland,its a different experience altogether. Wow! That tower room looks amazing! And the cake looks delicious. :) I had dinner in a small castle once, in Denmark. Pretty cool. I'd love to stay in one someday. Great to learn of your experience! Hope we get to stay in a castle soon! Wow I did not know that about Black Forest cake. Airbnb looks like a promising site too. I must explore especially the bit about staying in homes in other countries. Do register with Airbnb (using my referral link!) & explore the large number of accommodation choices available worldwide. That castle and its towers look fabulous indeed. Being a teetotaler, lemme see how I can manage the Rum!!! I am fairytale freak. and I loved your yummy post very much. Thanks for the detailed information. happy journey! That looks like an amazing place to stay! So beautiful! I hope you go and eat your cake.